Tatlin Vs Cotan 2008 Oil on Laminate flooring packing board. Although this portfolio should be of recent work, I have included this work because it provides a context to other works and makes clear my position as an observational artist. Which I think is important in terms of aligning myself with a New Materialist position. 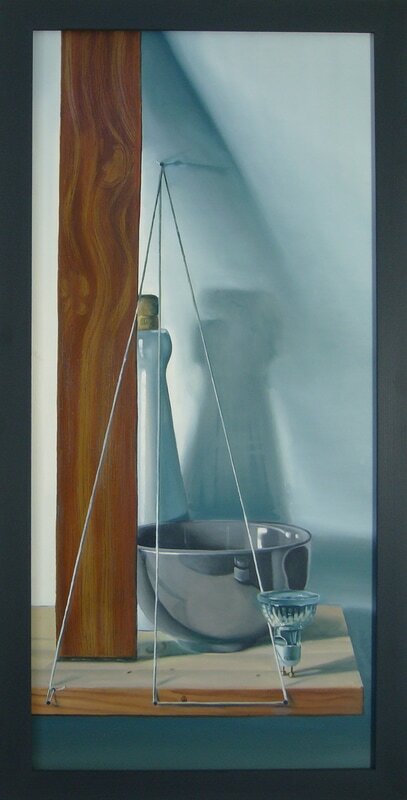 This work dates from just after my BA when I was working on still life’s, which were painted in long sittings under natural light. At the time it occurred to me that there was something meditational about my practice, but I didn’t know how this related to my interest in science or any contemporary position within the Arts. Tutors were directing me towards Morandi or Bodegons, but actually I think there was something else going on… and I always avoided painting food. Upon hearing Jane Bennett talking about Monastic traditions as a way of quietening the pull of the matter on us, I started reconsidering this earlier practice. Especially in light of Zurburan and Cotan, who were of course monks, and Professor Susan Blackmore's comparison of memetics and Budhism in terms of denying the ego towards the end of her book 'The Meme Machine' 1999. Still Life may actually be a particularly good fit with New Materialism due to the quiet listening to matter and the translation of matter into concept or culture that happens in the act of painting. I certainly think that an observational practice (or attentive - as it is not just about the gaze) can be defined, which includes aspects of the sciences and still life and incorporates experimentation and research as part of a practice.